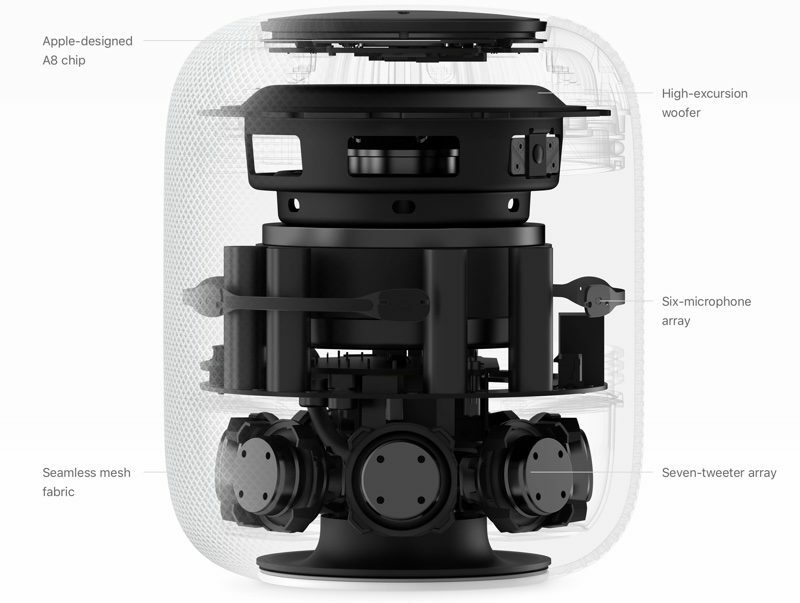 The HomePod is Apple’s first smart speaker, and it looks like a 7-inch-tall Mac Pro covered in mesh fabric. 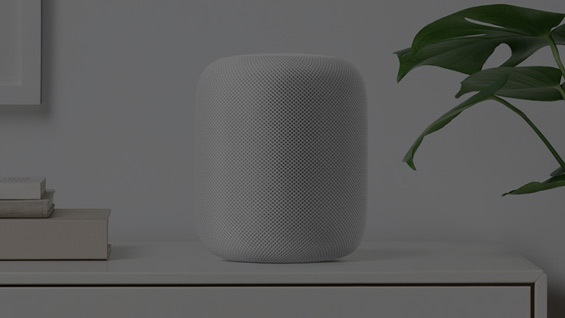 HomePod is a powerful speaker that sounds amazing and adapts to wherever it’s playing.HomePod combines Apple-engineered audio technology and advanced software to deliver the highest-fidelity sound throughout the room, anywhere it’s placed.HomePod takes the listening experience to a whole new level. This elegantly designed, compact speaker rocks the house.HomePod is built to bring out the best in Apple Music. With the intelligence of Siri and access to virtually all the world’s songs, it’s like having your very own musicologist who learns and plays what you like and helps you discover music you love. HomePod is wrapped in a seamless mesh fabric designed for both aesthetic and acoustic performance. Available in white and space gray, it’s gorgeous from every angle, yet virtually transparent to the music. And at just under seven inches tall, it can fit anywhere in your home.A series of seven tweeters are arranged around the bottom, while a 4-inch woofer pushes out meaty mids and lows from the top. Throw in the brain of an iPhone 6, which helps acoustically analyze the speaker’s surroundings to optimize sound based on what’s around it, and you’ve got a surprisingly powerful little speaker. Setting up HomePod is quick and magical. Simply plug it in, and your iOS device will detect it.This is pretty sweet: As with the AirPods, all you have to do is hold an iOS device (running the latest version) up to the HomePod. From there, the iDevice will recognize there’s a HomePod in front of it and begin the setup process.You’ll be asked whether you want the HomePod to take phone calls, access your messages and so on.Once you’ve zipped through Apple’s questions, you’re just left waiting for setup to complete. From start to finish, the process took about a minute. 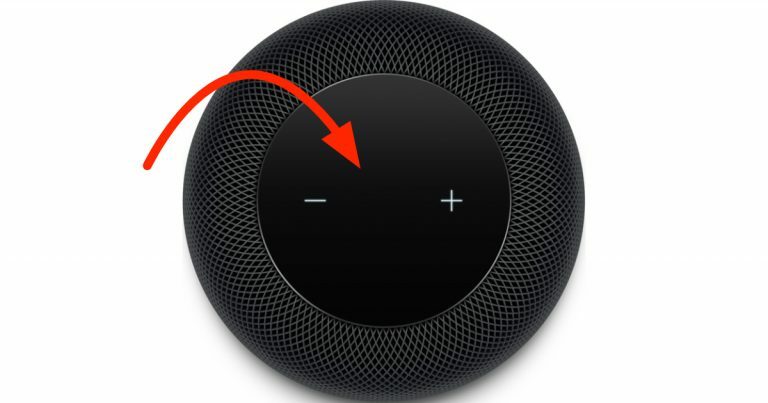 While you won’t get any of the voice control features baked into Apple Music, you can technically use your HomePod to play songs from Spotify, Amazon Music, or any other service. All you need to do is select HomePod as an AirPlay speaker from your phone or iPad as long as both devices are on the same Wi-Fi network. How Well Does Siri Work? Thanks to the metadata embedded into Apple Music tracks, Siri was also great at playing playlists for specific moods and offering up information about songs and artists we listened to. Since the HomePod also works as an extension of your phone.More important, Siri is always quick to react to commands, even when the HomePod was blasting tunes at 90 percent volume. When you set up HomePod, like any other Apple device, you’ll be asked to enter your iCloud address. You can use HomePod to send messages using just your voice. And when you receive a text, Siri can read it to you. For hands-free conversations, start or receive a call on your iPhone and hand it off to HomePod. An unsung feature of Apple’s HomePod is privacy, especially for people who are leery of letting always-on Wi-Fi-connected microphones into their homes. Apple promises that HomePod only starts listening after you wake it with, “Hey Siri,” but privacy on HomePod goes beyond that.If the main user whose iCloud account is tied to HomePod isn’t home (or rather, isn’t connected to the home Wi-Fi network), HomePod won’t deliver personal notifications, so texts and reminders won’t be shared with other people in your home. Even though it’s technically always on, HomePod uses very little power when it’s plugged into an outlet. The HomePod is so energy efficient because it automatically enters a low power mode after eight minutes of inactivity. In this mode, the speaker draws between only 1.71 and 1.76 watts of power. 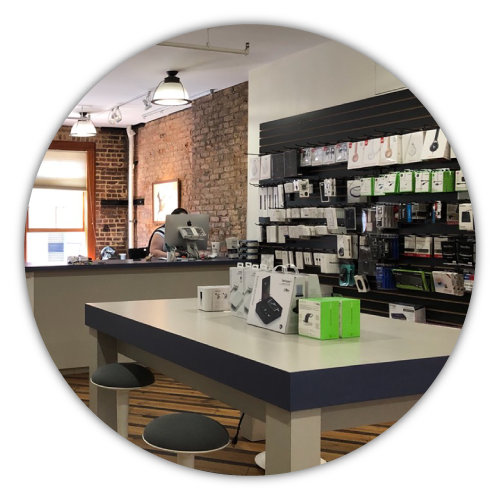 The combination of “optimized power management features,” such as dropping into low-power mode after 8 minutes of inactivity, and a high-efficiency power supply consumes about 50 percent less than the latest Energy Star specs require.